Discounted rates are given to students that register and pay by the early discount deadline. Call 906-482-2333 to register over the phone or e-mail ccarts@coppercountryarts.com for more information. Partial scholarships may be available for adult classes. Scholarship applicants should be able to state why attending class poses a financial hardship, their interest and/or background (if any) in the class they are interested in taking, and what kind of volunteer work they are able to do. ﻿Partial scholarships are available for youth art camps﻿﻿. Availability varies each year. Contact bonnie@coppercountryarts.com for more information. Download the full 2019 SPRING CATALOGUE. Get inspired - send your Valentine(s) a hand written letter. Some items will be available to give it that special holiday look: glitter, red paper, plus books of poetry for inspiration. Bring some paper and your favorite pen. Make a fancy envelope; templates and glue sticks available. Letter Writing Socials are facilitated by Cynthia Coté who loves getting real mail and strives to keep her favorite postal workers employed. She is a Mail Artist and member of the Letter Writers Alliance. The Letter Writers Alliance is a membership organization dedicated to keeping the art of letter writing alive. Membership is open to anyone interested in letter writing. No fee. Postage stamps will be available for purchase. Call the CCCAC at 482-2333 to RSVP by Thursday, February 7. A cousin to watercolor paint, gouache is a colorful, opaque, water-based paint that has a history of use stretching back several hundred years. Learn and explore gouache painting techniques in this workshop lead by local artist Terri Jo Frew. Participants will take home finished artworks on paper and one 6”x6” canvas. No previous experience is required. Fee: $50 by February 2; $60 after. Deadline to register: February 9. Learn the alphabet in a new way! Set lead and wood type from the CCCAC’s letterpress studio collection and print specimens of different type styles on a Vandercook No. 4 proofing press. Participants in this workshop will learn some basic typesetting and letterpress printing skills, along with some printing history, while helping the Arts Center document its type collection. Fee: $65 by February 2; $75 after. Deadline to register: February 9. Learn how to create pen & ink drawings. Two techniques, stippling & hatching, will be taught, along with an opportunity for students to practice. No previous experience in drawing or painting is needed to take this class. Once your drawing is perfect a watercolor wash may be added to the drawing to complete a painting. In 1st class we will work on a still life and in second class a landscape. All supplies and handouts are included. This is an adult class, but ages 10 and up are welcome. Fee: $65 by February 5; $75 after. Deadline to register: February 12. In this class the participants will learn how to hand build a shadow box out of clay. This process will include coil and slab building techniques. After the box is constructed the narrative elements will be included. These elements can range from figures made out of clay to post firing mixed media additions. The shadow box and any clay components will be bisque fired and then glazed. Any additional mixed media elements can then be applied. Independent studio time included; class skips March 5. Fee: $90 by February 5; $100 after. Deadline to register: February 12. Wine and light snacks. Please RSVP by Thursday, February 14. Get started exploring the wonderful world of watercolor! You’ll learn painting basics including materials, paper, techniques and color mixing and then go on to create a simple watercolor landscape painting with step-by-step instructions and demonstrations from the instructor. Fee: $45 by February 16; $55 after. Deadline to register: February 23. Students will learn bead appliqué stitch to create a circular beaded brooch or pair of earrings. The beadwork rosette is stitched on Ultrasuede. The rosette and leather backing are joined together with a decorative beaded edging and a metal pin back (or wires for earrings) are attached. The instructor will demonstrate the stitch and techniques for handling the tools and materials. Samples of beadwork will be shown and a brief survey of appliqué beadwork will be presented. All materials will be provided. Fee: $55 by February 19; $65 after. Deadline to register: February 26. Students will learn introductory ceramics skills through hand-building including coil-building and slab-building. Youth will have the opportunity to learn ceramics and pottery terminology and development background knowledge for the process. Options may also be sculptural. Fee: $55 by February 20: $65 after. Deadline to register: February 27. Students will learn elements of design through illustration and how to look for quality in contrast, composition, line-art, etc. Students will have options for life studies and for developing a final piece with conceptual guidance and subjective freedom. Fee: $50 by February 21; $60 after. Deadline to register: February 28. Over the course of this comic workshop students will create up to five pages of comic content. This can be several short comics, a short story, or an introduction to a longer work. We will decide on a theme together as a class, and students may approach the theme as they wish. All comics will be collected into an anthology, which will be printed. All students will receive one copy of our comic anthology. Students will learn about comic basics and preparing a comic for print, and receive individual instruction depending on level with making comics. Ages: teen-adult. All skill levels welcome! Digital artists are welcome, but please bring your own tablet. Fee: $90 by February 23; $100 after. Deadline to register: March 2. This is a fun introductory class for beginners who want to get started with exploring acrylic painting in a social, relaxed, non-stressful way. You’ll learn acrylic painting basics including materials, color mixing and composition and then go on to create a floral painting on small canvas with step-by-step instructions and guidance from the instructor. Bring your own photo reference or choose from one of ours. Fee: $35 by March 5; $45 after. Deadline to register: March 12. Pen and ink is an amazingly versatile historic medium that lends itself well to creating contemporary graphic art and illustrations. This style of drawing is often seen in comics, graphic novels, narrative art, illustration, and animations to name a few. Students in this class will learn line drawing techniques using a traditional stylus and nib, and color-filling techniques using colored ink and brushes. Adult class; age 13 and up are welcome. Fee: $55 by March 9; $65 after. Deadline to register: March 16. In the Pet portrait painting workshop students will create a colorful acrylic pet portrait on canvas from a photograph. Step-by-step instructions for beginners will be available and experienced painters are encouraged to explore their personal style and practice different techniques. All supplies are included. Please bring a clear 8x10 photo of your pet. Adult class, but ages 10 and up are welcome. Fee: $55 by March 12; $65 after. Deadline to register: March 19. The goal of these classes is to help students hone their writing craft and edit their manuscripts. Each class will go in-depth about a various topic related to improving their manuscript. This can allow more experienced writers to focus on possible problem spots in their writing, while providing newer writers with insight on ways to improve their craft. Fee: $60 by March 12; $70 after. Deadline to register: March 19. March is Celebrate Youth Arts Month! Both the Kerredge Gallery and Youth Gallery will be filled floor to ceiling with amazing youth art. March is a time where our young artists get to shine and it’s a time not only to celebrate youth art, but to appreciate the art teachers who work throughout the school year encouraging and inspiring their students. Summer Arts Camp is five fun days of art making for kids in 3rd-6th grades! Students may choose from one of two week-long sessions. Session dates and camp them will be announced in March. Partial scholarships are available for youth art camps. Availability varies each year. Contact bonnie@coppercountryarts.com for requirements and details on how to apply. Programs begin in the spring. Check back for dates and classes. Programming has been made possible with support from the Michigan Council for Arts and Cultural Affairs and Portage Health Auxiliary sponsorship. This is a unique opportunity for students in grades 8-12 to study bookbinding, creative writing, zines, paper marbling, letterpress printing, and block printing. In this class, students will learn how to shoot, develop, and wet-print black and white photographs. This class will meet for six weeks and students will learn how to use the camera and how black and white film works, the aesthetics when photographing in black and white, printing test strips, and wet printing. The final session will be a show and tell. Students should have their own camera, some Arts Center cameras may be available for use. Fee: $195 by March 19; $205 after. Deadline to register: March 26.
techniques will be demonstrated throughout the class. Fee: $75 by March 19; $85 after. Deadline to register: March 26.
composition, line-art, etc. Students will have options for life studies and for developing a final piece with conceptual guidance and subjective freedom. Fee: $50 by March 20; $60 after. Deadline to register: March 27. Students will learn introductory ceramics skills through hand-building including coil-building and slab-building. They will have the opportunity to learn ceramics and pottery terminology while developing background knowledge for the process. Fee: $55 by March 21: $65 after. Deadline: March 28. In this series of classes students will explore a variety of traditional watercolor techniques - washes, wet-into-wet, wet onto dry, glazing, negative painting, masking to paint colorful flowers, animals and landscapes. With the help of group demonstrations and one-on-one instruction students will create a new painting each week. All supplies and source images will be provided. All skill levels are welcome- absolute beginners and beyond. New projects for returning students, class runs for four sessions, skipping April 18th. Fee: $150 by March 21; $160 after. Deadline to register: March 28. This class will introduce students to the basic skills involved in letterpress printing using hand-set lead and wood type. Students will set type, compose printing forms, and print using hand-operated tabletop platen presses. The class emphasizes technical competency but will also explore the history of letterpress printing, which goes back to the fifteenth century, and the craft’s place within contemporary books arts. Students in this class can take a test to become certified to use the Arts Center’s letterpress studio, where they can work on independent printing projects during regular open studio hours. Fee: $195 by March 22: $205 after. Deadline to register: March 29. We live in a complex, multidimensional world, and the art we make enriches it. But we also make much of the world itself – we shape spaces, and give them meaning. In this 4-part class, participants will explore and digitally model a series of personally meaningful places, while learning basic SketchUp skills in the process. Fee: $150 by March 23; $160 after. Deadline to register: March 30. Lean how to create a Crisscross Binding or also known as a “Secret Belgian Binding.” Students will create this intriguing non-adhesive structure that has a hard spine and lies flat. Fee: $55 by April 25; $65 after. Deadline: May 2. This class is designed for students at all skill levels interested in exploring portrait painting using watercolor. The emphasis will be on working with accurate value relationships using a limited palette and a variety of edges to render 3D form. The goal of the class is to demystify portrait painting with the help of group demonstrations and one on one guidance. Source images and handouts will be provided. No drawing skills are needed, however some previous exposure to watercolor is helpful. Fee: $65 by April 27; $ 75after. Deadline to register: May 4.
ceramic objects and tiles through slab construction, both decorative wall pieces and functional ware. Materials included. Class includes 10 hours independent studio time to work on projects outside of class time. Fee: $150 by April 27; $160 after. Deadline to register: May 4. In this workshop, students will bring a selection of their work to have critiqued by the instructor and other students. We will establish a set of critique guidelines, and designate 10–15 minutes per student to read their selections and get feedback. Fee: $20 by May 1; $30 after. Deadline to register: May 7. Artist Tobias Dawson will describe developing a design language based on story themes from familiar traditional tales. Please RSVP by Friday, May 17. Fee: $60 by May 7; $70 after. Deadline to register: May 14. JOHN ARNOLD is an Architect with broad interests in developing and maintaining healthy cultural landscapes. John hails from Alaska (which is mostly nature) and has practiced in Washington, Oregon, and California (which are mostly people), and moved to the Keweenaw to live and work in a place which balances the two just about perfectly. CYNTHIA COTÉ is the founding director of the CCCAC. She balances her work as a studio artist and an arts administrator. Her art is a mix of drawing, collage and re-assembled books as well as fiber art and beadwork. KAITLYN DODGE is an artist currently studying applied ecology at Michigan Technological University. Previously, she was a chalkboard artist and graphic designer for Whole Foods Market Milwaukee. STEPHANIE FLINT graduated from the University of Central Missouri with a Bachelor of Science in photography and a minor in creative writing. She merged the two interests into book cover design and photographic illustration, but she particularly enjoys writing speculative fiction. She’s currently writing The Wishing Blade, a fantasy series, and she co-authored Distant Horizon and Glitch, a YA science fiction series. TERRI FREW is a Canadian artist and educator based in the Keweenaw. Frequent themes found in her work include nature, animals, and the occult. Terri holds a Master’s of Fine Art degree from Concordia University, Montréal Canada. PAIGE GWYN is an intermedia artist and a certified K-12 art teacher with a BFA and two years of teaching experience. She is working to obtain an MA in education. LINDSEY HEIDEN recently moved back to the U.P. with her family from Fayetteville, Arkansas. Her work is sculptural and for the past couple of years, she has worked in a miniature scale. Through her work, she tells stories with a cast of modified animal characters that show up through a variety of narratives and forms. STEFKA HRISTOVA Dr. Stefka Hristova is Associate Professor of Digital Media in the Humanities Department at Michigan Technological University, where she teaches photography and Photoshop. PAMELA KOTILA is a comic artist and illustrator with a focus on comics. They currently publish three comics online, and have printed and published four projects in the past two years. BONNIE LOUKUS is an artist and Assistant Director of the CCCAC. She holds a BA in interdisciplinary arts from Finlandia University. MADHURA MEHENDALE is an artist who focuses on watercolor and acrylic painting. DANIEL SCHNEIDER is a book artist and holds a Master’s degree in Industrial Archaeology. He has taught numerous classes in letterpress printing. BILL THOMPSON is a working studio artist, disabled veteran, and holds a Bachelor’s of Fine Art from Finlandia University. Love clay and need a space to work on your upcoming projects? Join our Clay Co-Op! The fee to join is $30 for each 15 hour punch card and $1 per pound of clay. 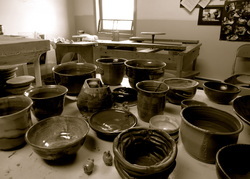 The fee includes existing glazes, tools, and studio usage. Previous experience with clay is required before joining the Co-Op. Play with Clay Every Monday from 5-7pm. Need some time to de-stress and re-introduce yourself to clay? Stop by Play with Clay on Mondays from 5-7pm. $12 for two hours of clay time. No firing, no glaze-just play and clean up! Contact CCCAC Clay Co-Op Manager Tammy Gajewski at tojgajewski@gmail.com for more information. The CCCAC darkroom is available to experienced photographers for black and white developing. E-mail ccarts@coppercountryarts.com for more information. Fostering an Environment where the Arts and People Grow Together.